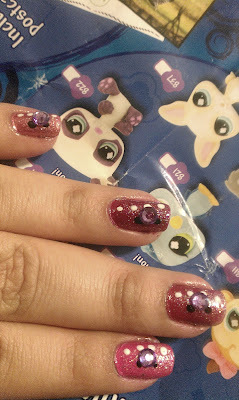 Thank you to those who participated in my POP Nail Contest! Please enjoy the following entries and winner! Amber used 2 coats of NARS Galion, one coat of Cult Nails Hypnotize Me and stamped it with Zoya Trixie. She was going for a design that someone who is "nail art challenged" could pull off, and I think she did excellent! It's almost like a gold dipped fishnet, which I think is super neat. 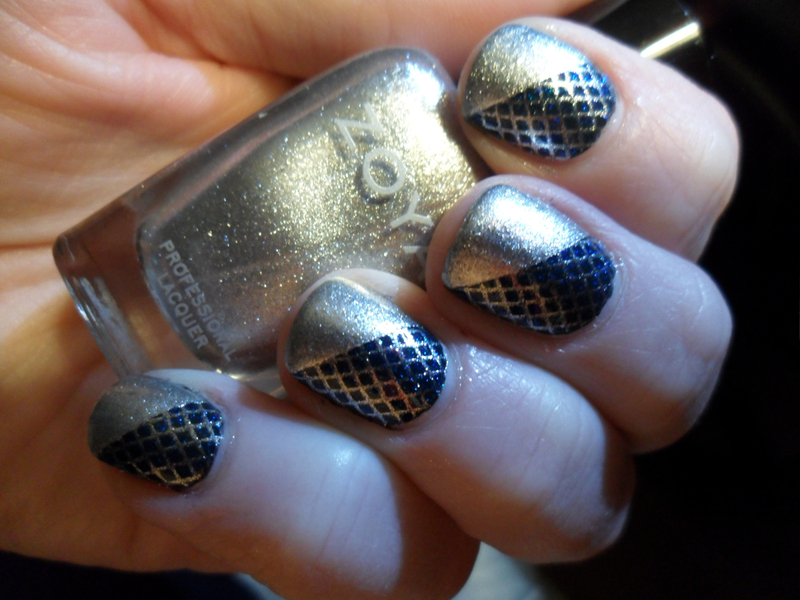 Angie is a blogger who really loves metallic polishes. She used Zoya Penny on her middle and pinky fingers and Julep Zoe on her pointer and ring fingers and then added Zoya Ginessa on the tips. This was actually her first attempt at nail art and I'm calling it a great one! Cheryl was inspired by Maria from R3Daily/CultNails and her July 4th mani ideas to create this spin on the American Flag. She used Sally Hansen Xtreme Wear White On, China Glaze Phat Santa and Wet n Wild Crazy Nocturnal. 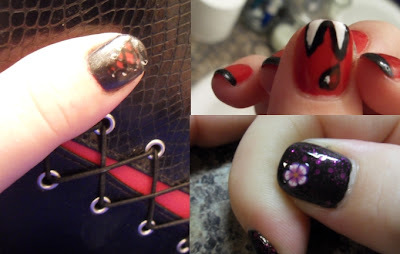 For her stamping of the "flag stripes", she used Bundle Monster plate 210 and then for her thumb, Cheryl used a bobby pin. Talk about creative! Want to know how Gabbz came up with this Hello Kitty manicure? Check out her blog here for her inspiration, the colors she utilized and even the stamping plate that was used! Gift Princess created a pretty awesome looking take on a rainbow here, but unfortunately I don't have any information on the polishes used or her inspiration. It's super pretty though! Ferfer Lynn is also a blogger who used her daughter's hands to create this awesome Halloween look using Wet n Wild Blue Moon and acrylic paints. Then on top of it all? China Glaze Ghoulish Glow. I just picked up a new bottle myself - I wonder what all she made glow... the ghost? The eyes? The RIP? Heh. 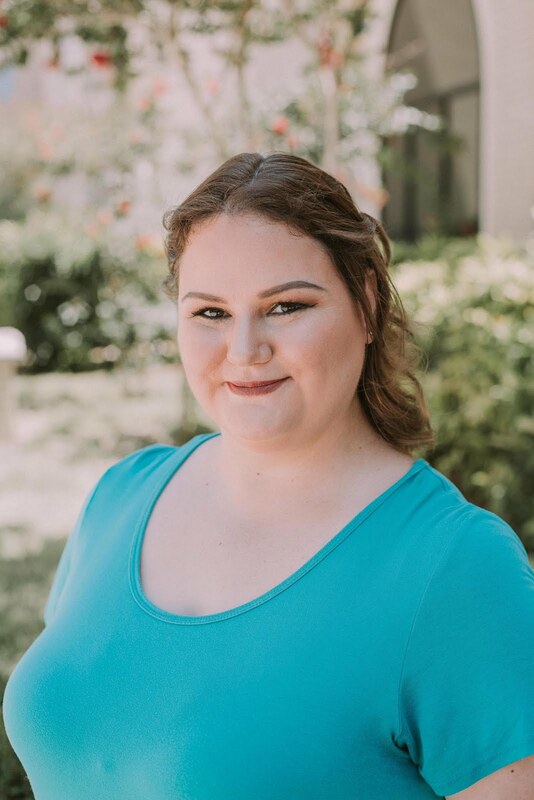 As SOON as I saw Kristi's submission, I KNEW it was inspirited by True Blood (and the Tarte makeup kit on the left!). 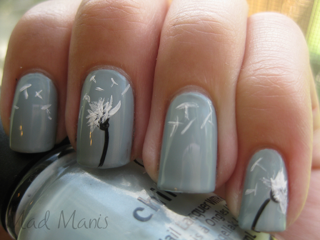 Kristi is also a blogger who used Zoya Kristi, Forever 21 Charcoal and white and black Art Deco nail art polishes. She was definitely up in my top 3, especially for my obsession with TB. Myra was in the mood for Berry Smoothies the day she made this so she decided on the berry inspired color and then combined a bit of the Littlest Pet Shop... Her nails are really an "End of the Summer" combo. I really love the added purple stones - I'm such a sucker for purple! Laina was our runner up. 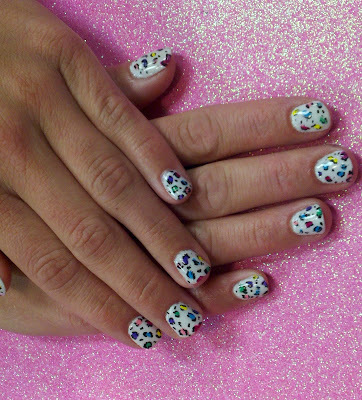 Her colored cheetah look has a sweet burst of color sprinkled throughout. I wish I had the patience to do this with all the colors used in the dots. She has over 14 nail techs in her current salon and has a franchise of ~70 total techs in her area. I need to make a visit, hah! And there you have it! Thank you again so much for participating and letting us see your nail art! Congrats to the winner! Those pictures are lovely! I love everyone's manicure! Very cute ideas! All of them are absolutely gorgeous!